A strike affecting all care by junior doctors will "irreparably damage" trust and the profession's reputation, NHS England's medical director has said. Writing in the Observer, Sir Bruce Keogh said the planned walkout in England on 26 and 27 April would put significant strain on services. Action in the row over a new contract has not affected emergency care so far. The British Medical Association said disruption was avoidable if the government agreed to return to talks. Ministers, however, are refusing to reopen discussions, arguing they made compromises earlier in the year but the BMA did not. A spokesman for Health Secretary Jeremy Hunt said the strike was "disproportionate... damaging and unnecessary". The fourth strike in the dispute ran for for 48 hours from 08:00 BST on 6 April. Junior doctors did not provide routine care and about 5,000 operations and procedures were postponed. The strikes later this month will be escalated to include all forms of care including emergencies. In his article, Sir Bruce says "junior doctors will be grappling with their consciences" as the new strike date approaches. "This is a watershed moment for the NHS - and a difficult time for the medical profession," he writes. Sir Bruce does note that junior doctors feel disengaged and powerless and that all parties have a responsibility to solve the "underlying issues". "Whatever the rights and wrongs of this complex dispute, this is a very serious state of affairs." The new action, says Sir Bruce, will put additional significant strain on A&E, intensive care and maternity services, particularly in smaller hospitals. "I worry that the withdrawal of emergency cover will put our sickest, most vulnerable patients at greater risk." He calls on doctors to "dig deep" and ask whether the action is fair to patients or compatible with the values and privilege of the profession. 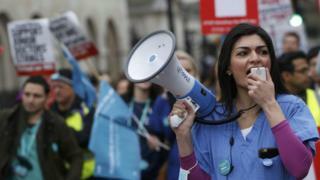 The BMA urged the government to get back round the table and end the dispute through talks, reiterating that senior doctors would provide emergency care on the strike days. It disputes the government's assertion that changes to doctors' contracts, which will see them paid less for working weekends while basic pay is increased, are needed to improve care at weekends. The union's junior doctors' leader, Dr Johann Malawana, tells the Observer: "No junior doctor wants to take this action but we have been left with no choice. "We regret any disruption caused to patients and have given trusts enough notice for them to plan ahead. "It is disappointing that Bruce Keogh is attacking front-line doctors rather than echoing calls, from patients' groups to senior NHS managers, for the government to get back around the table and end this dispute through talks." Mr Hunt's spokesman said: "Withdrawing emergency care poses huge risks to patient safety and will be very difficult for the consultants, nurses and other allied health professionals who will be stretched to provide cover. "This action is disproportionate, so we urge the BMA to call their damaging and unnecessary strike off."